My Pennant Pantry -- plus a couple cool things! My Pennant Pantry — plus a couple cool things! I had a terrible sinus infection last week, and got all hyped up on Sudafed. On Friday night at eleven-o-clock I thought it would be an awesome idea to rip my pantry apart and paint it. So that’s what I did. I’m not saying it didn’t need it. It totally did!! This floral shelf liner had been on the shelves since we moved in 8 years ago, and even then it wasn’t my favorite. I told you I was a procrastinator – lol. Note: Total Delivery Timeline for Alaska and Hawaii orders may take up to two additional business days. Note: Home Delivery is not available in Alaska and Hawaii. Delivery to remote locations within the continental United States may take longer. Home Delivery service varies by product. Most deliveries (building materials/remodel products/outdoor products) will be either left in a dry area outside or taken inside the home to the first room (electronics/furniture/high end appliances). Product assembly, unpacking, and debris removal are not provided. The delivery carrier will contact you to schedule a 4-hour delivery window for inside deliveries. Outside deliveries do not require you to be home and therefore an appointment will not be scheduled. Deliveries are made between 8 am and 6 pm, Monday through Friday. If the product arrives with visible damage, please refuse delivery and immediately contact customer service at 1-800-430-3376. Saturday I decided that it just needed something else. 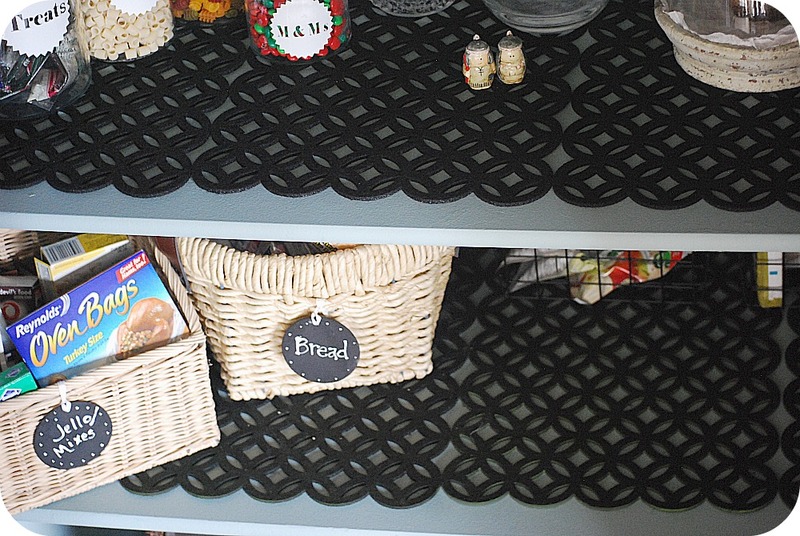 And you know there are so many great pantry makeovers out there. I love Shelley’s at House of Smiths and Beth from the Stories of A to Z recently did a great pantry makeover too. I decided to make some pennants on my Silhouette. I started experimenting and discovered that there were a set of three downloadable pennants at the Silhouette Online Store and for .99 cents, that was so much easier than trying to design my own! So I printed them off and had a fantastic time adding a little whimsy to a part of my house that we use more than anything else! And at the top of the pantry I hung a real pennant. I had a hard time getting the lighting right since it’s a pantry and pretty dark. I almost went a little crazy and wanted to hang a chandelier in there, but ultimately I thought that would be going a little too far for a pantry. But, who knows — maybe I still will. A very small chandelier! I couldn’t find any shelf liner that I liked. Then I remembered that I had bought some patterned felt placemats on sale at TJ Maxx last year — so I used those on the shelves. It’s lucky that I bought four sets. I guess it was fate – lol. And, I had some empty silver containers that I had bought for my office and never used. Perfect! I also printed some vinyl labels off for some canisters I found at Ikea. It was great to organize all of our food. I had some wire baskets that I had bought for my Laundry Room Redo and never used, so I brought those out. 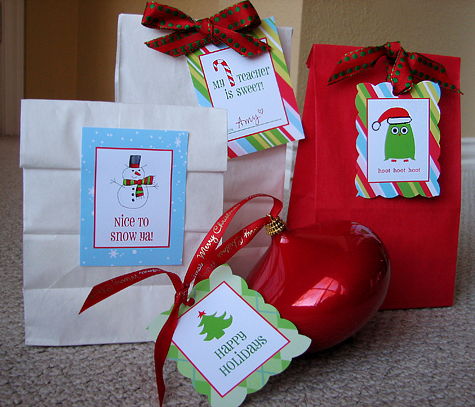 And then on a trip to Ikea on Saturday, I found some round gift tags. I brought them home and sprayed them with some Chalkboard Spray Paint to make little tags. I’m still loving those Chalkboard pens. If you don’t have those — put them on your Christmas list! You can find them at Michaels. Another thing that I love is the over-the-door organizer that I bought. It is a great place to keep things that get a lot of use, like salt and pepper shakers and big spice containers. It frees up much needed shelf space. I am really excited to have a place to keep extra serving pieces and glass water pitchers. And I even found a spot for my Silverware Wreath!! So there you have it — my weekend Sudafed project! I have a bunch of tutorials that I am so excited to share. I am going to sneak them in this week, along with the other fun stuff that I will be sharing. And speaking of sharing, I am guest posting a Burlap Scrabble Thanksgiving Wreath on a super fun blog — Living Locurto! If you aren’t familiar with Amy’s blog — come over and check it out! And, I’m having a giveaway over on my Tatertots & Jello Facebook page!! Check out TWIG — an awesome shop I found a couple weeks ago!! It’s run by the cutest couple — Michelle and Steve. They make really cool, modern gifts. Come over and see what they are giving away! I’m linking up to these fabulous parties – check them out!! Getting Organized in 2012 — Organizing Cleaning Supplies and Free Label Printables! Organization Project — My Kitchen Command Station!! Monday Giveaway — $150 Honeybear Lane Quilt! Guest Project — Build a DIY Steel and Marble Dining Room Table! I have a serious case of pantry envy after seeing this. I just bought a house and it doesn’t have any kind of pantry to speak of. I am hoping to have a cabinet/cupboard pantry built some time soon, but it will never be as grand as yours. Even knowing this, your pantry truly is inspiring and I hope to use some of your ideas and adapt them for my tiny kitchen. I love your pantry~! My husband will be traveling the next month and i’m pretty sure i’ll be using your idea for a fun surprise for when he returns. Brie Farmer » So fun!! Let me know if you make yours over – I would love to see it! I REALLY need to do something to my pantry! Thanks for such great inspiration! Looks Fabulous! I had someone ask about the door hanger in the pantry. Yes, it is a shoe organizer. I found it on clearance at TJ Maxx for $5. Love the polka dots!!! I'd would LOVE to do this but I can't do the $175 machine right now to make the pennants. Can I interest anyone in making them and I pay them for some? Please let me know. That is one of the BEST pantry makeovers I have ever seen…and having done mine recently (and researched ideas) I have seen A LOT!! 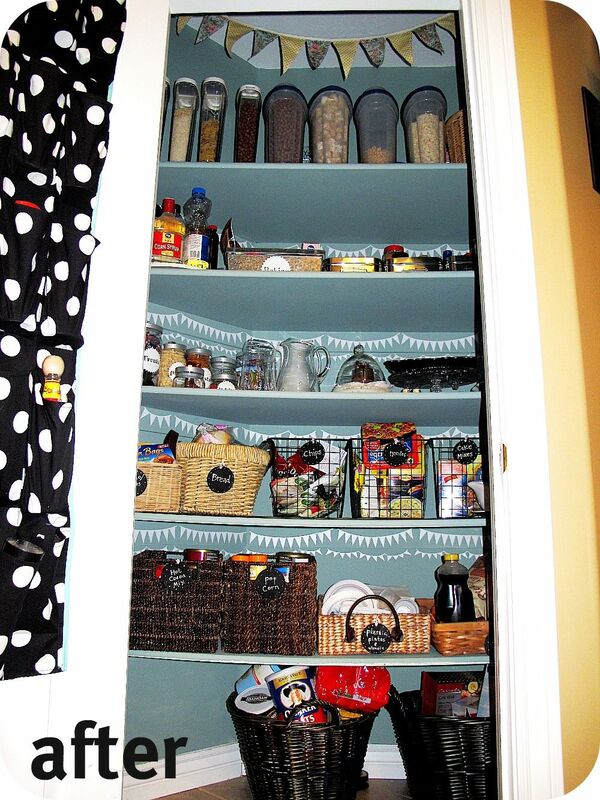 wow i absolutely love your pantry wish i could do something like that to mine but the mother in law would kill me. WOW! Your pantry looks amazing! I AM putting Chalkboard Pins AND Paint on my Christmas List! Thanks for the ideas! You are one busy lady! Love the pantry and love the wreath too! It looks gorgeous! The thing about everything you do is that it speaks happiness and a cheerful spirit and I just LOVE that about your work. Love the redo! Looks great. The last tear through redo I did like that was the master bedroom closet. I demoed and redid the entire closet in two days. I was flying high over my accomplishment for a month. You have inspired me to want to paint the inside of my pantry…why I had never thought of that is beyond me. Wow Jenn, this is incredible!! You have really outdone yourself this time!! Gorgeous! 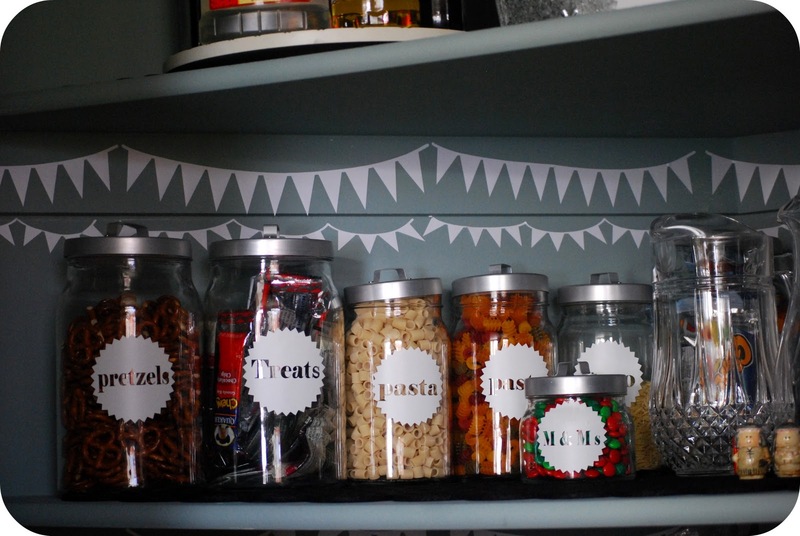 I'm crazy over those little flags, esp the family one on the inside and I love that you did the pantry door too!! That does it. My kitchen is getting a good dose of chalkboard paint somewhere. Off to go brainstorm. jen!!! are you kidding me??? 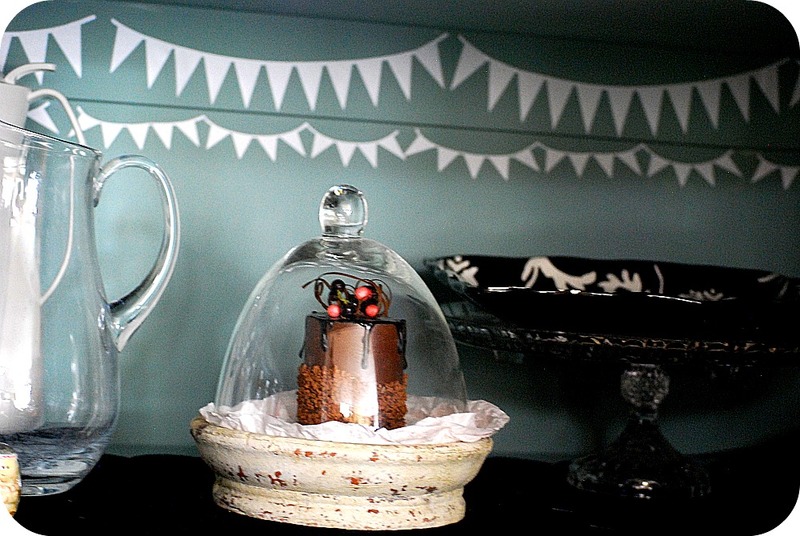 bunting in the pantry. you know i loved you before, but this has me over the moon jealous in a good way. you are soooo amazing. how in the heck??? oh my word. i see that door is painted black too. girlfriend has your company visited yet? are you exhausted? this is crazy good! and so very fun! love it! You are crazy! And I mean that in the most loving and nice way. 🙂 I love the pantry! LOVE IT! 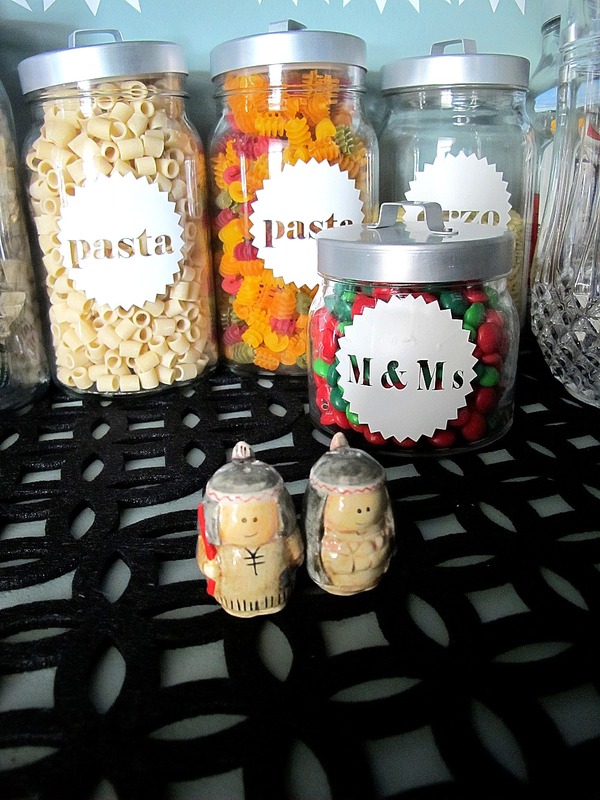 And I love how the M & Ms are right next to the pasta. Two staples. haha The pennants are too cute. WOW!! I'm on my way to go pick up some sudafed now! 😉 GORGEOUS pantry! Does that even sound right together? 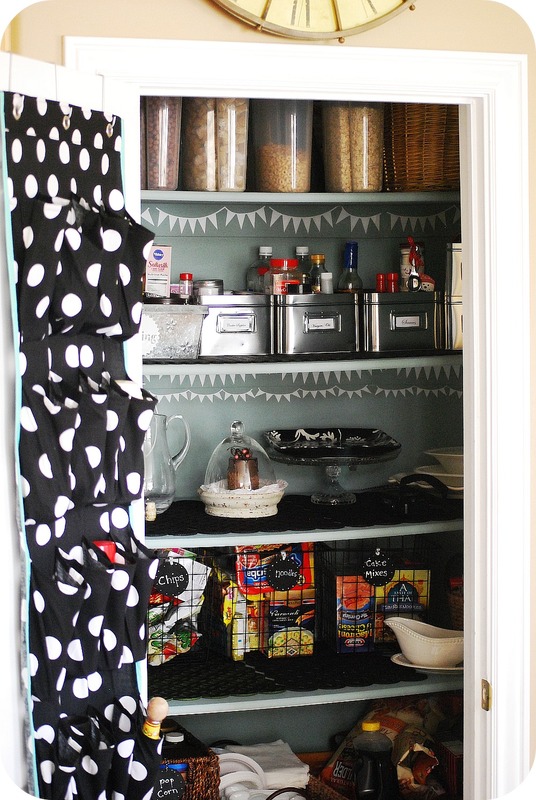 Well, that is the cutest pantry ever! I can't even do things like that when I feel WELL, let alone, sick! Jen, you are an inspiration! That was officially the world's longest comment. Sorry! I am having a love/hate relationship with you. You see, I don't have a pantry. Nope. Nothing but big, giant, completely shallow and disfunctional honey-oak nightmares from 1997. And so….while I love everything about you, you kind of remind me how I am lacking one of you. But if I did have you….I would SOOOO use those silver IKEA bins in you. Because I have those for all my DVD's and they are completely the coolest. And I would also make sure you always smelled yummy, and that you were never over (or under) stocked. And so, Jen's pantry, I want you to know that I love you. Even though I am jealous of you. And I think your new makeover is beyond marvie. And if you get a chandelier….I might not be able to overcome my jealousy. I think that is the prettiest pantry I've ever seen! I love that thing on the inside of the door! And I need to take some Sudefed so I can get some things done around here. I am cracking up at your pantry makeover Sudafed project. That is such a Jen pantry. Love it with you pennant self. Would you still be my friend if I admitted I haven't made a pennant yet? I am excited to check Twig out at the Bijou Market this weekend! I think my little guy needs that camera! It looks amazing Jen! 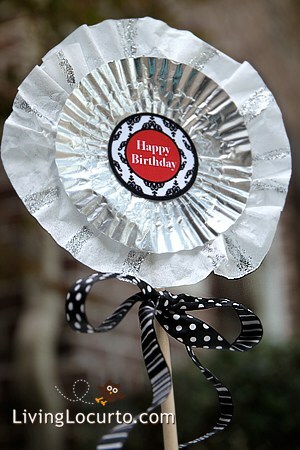 Love your little pennant banners and your labels look great. Thanks for linking to me :)! I am speechless! How, what, where, when…I wish you could come over here and help me in so many areas in my house! I love it!!! You have no idea how much this sounds like something I would do! Be sick, need to be resting, and instead doing something totally crazy and genius at the same time with my house! Lol! I just can't stand to be idle for very long, even when I should be. I also re-did my pantry a while back, but it's not nearly as pretty! So fun Jen! It's like a party in your pantry! I wish I had a pantry like that to do something fun. Ours is a cabinet, not one to walk into. Wow Jen!! You are amazing!!! I can't believe you did that sick! The pennants just are the sweetest thing ever. I love the way everything turned out!! Oh c'mon! Now I can't go into my pantry while it's so white and semiboring. So not right! 😀 I would so paint it at midnight too, sick or not lol, fabulous job!! UGH! You are a brat. NO WAY! You are too creative for your own good. Come to my house please:-) Thanks for the awesome shout out! So adorable! I can't believe you started it at 11 at night! I love all that small little added touches and it looks so organized now. And that's why my house is land of unfinished projects and your is stinking cute- b/c when I'm sick, I lay around and moan alot and you actually DO stuff. Great job Jen! 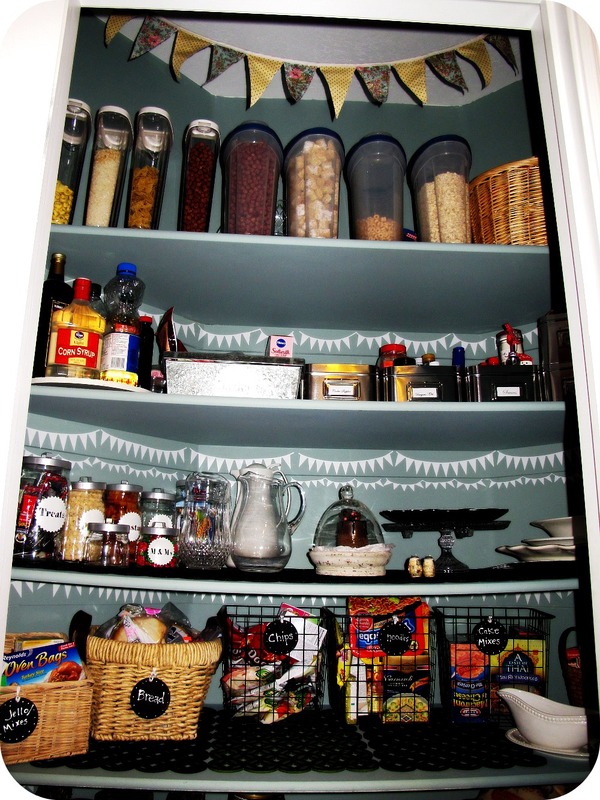 Your pantry is amazing and so perfectly YOU! Thanks for sharing, and I hope you are feeling much better. This was a midnight project? Lol! The kind of midnight projects I would come up with aren't nearly as neat as yours. I'm hugely impressed! Every time I turn around I see you are working on another project or blog or are a guest speaker. AND you have time to do your pantry? PS I submitted my bathroom makeover to the CSI project. I don't usually submit stuff b/c I'm lazy, but I LOVE my bathroom, and I did the entire thing BY MYSELF! Yay! Very spiffy! I'm so impressed by what sudafed does to you. It had been quite a while since I'd taken sudafed, and then a couple of years ago I took some when I had a bad cold. Oh my goodness, I don't know if my metabolism had changed or if it was because I hadn't had much to eat that day, but it was s-c-a-r-y. My children are still talking about it. Apparently, I sang and laughed and told incredibly funny jokes while I washed a huge pile of dishes in less than 10 minutes. My daughter claims that when I finished the dishes, I waved the dishtowel in the air and proclaimed, "I have climbed the Mt. Everest of dishes, and I claim it for America!" Maybe next time I'll redo my pantry, instead of just doing dishes. Great makeover!! Too many fun features to even mention. Definitely inspiring! I love the placemats as liners; I was SO going to ask you about them if you didn't mention them. And I love that you have a wreath in your pantry!! Hope you feeling 100% better by now! Can I just say… AWESOME! 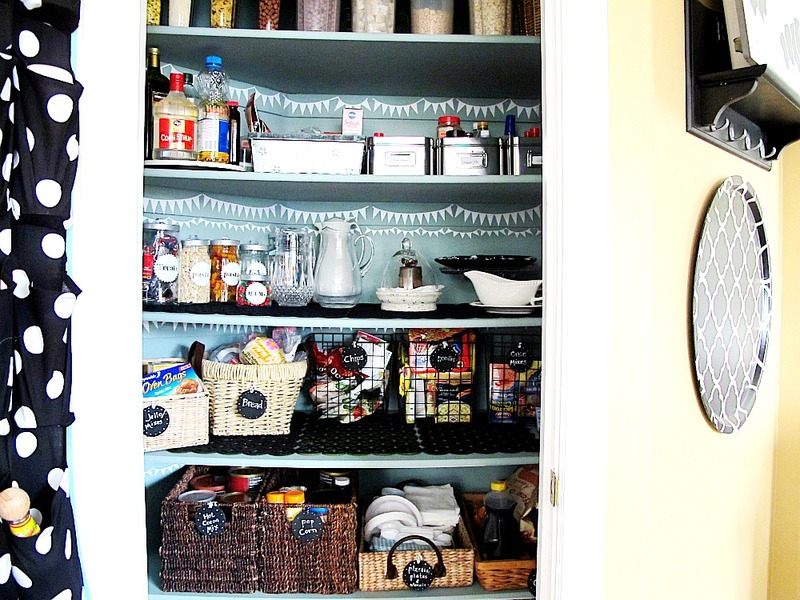 How can you make a pantry look so gorgeous? Amazing. O.k, it's on like Donkey Kong!! You have inspired me to tackle my nasty looking pantry! Can't wait to get started! cutest pantry i have ever seen! love it! Your pantry looks amazing! Now I have pantry envy! AMAZING! 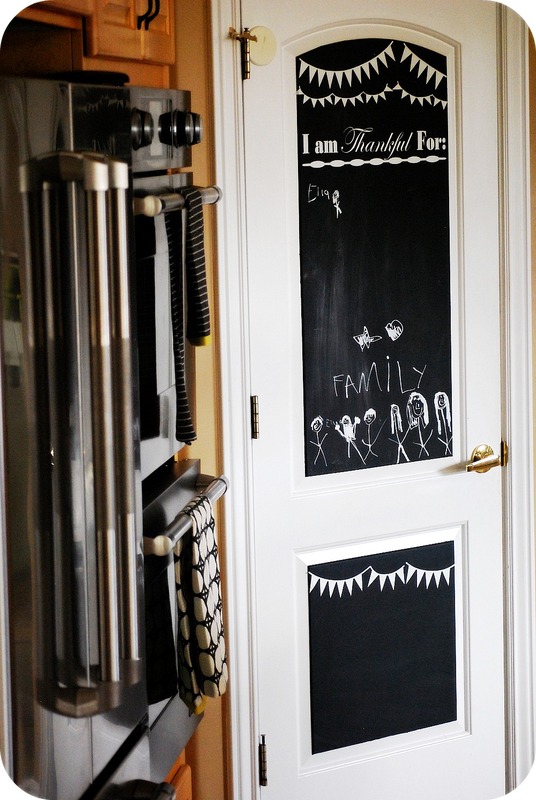 I NEEEEEED those chalkboard pens! Good thing I have a 40% off coupon hanging out in my purse!! Do you have an etsy account? I'd love to buy some pennants. Is this possible? That is hands down, the best looking pantry I have ever seen! I just want to live in it! Sudafed=awesome decorating ideas! My pantry needs a makeover too, so next time I have a sinus mess in my head I know what to take and hopefully it will inspire me as much as it did you. I too love the Martha Stewart blueish/green. I painted the inside of my china cabinet that color and love it. Now you've got me thinking I should do my pantry. Hmmmm!?!?!?!? Great post Jen, you are so talented! I'm so completely jealous of that awesome pantry! Great Pantry Makeover! I too LOVE an organized pantry. Peek inside mine, if you'd like. LOVE it!!! It looks fantastic!!! This is one for the ages! You rock! WOW what a befor and after! Great job! LOVE the use of the felt placemats. My first question when I saw the pics: where did she get those shelf liners? LOL. Love all the details: the color, the tags, the containers, etc. 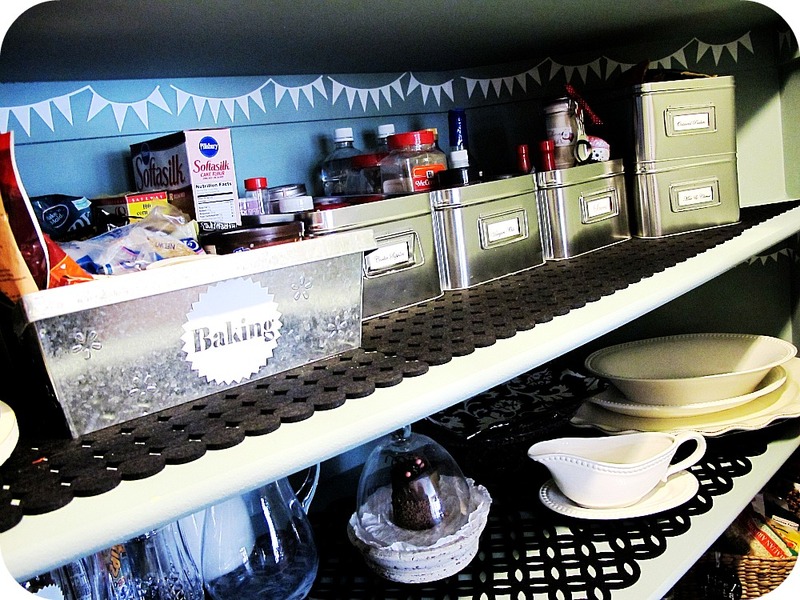 I love your Sudafed-inspired pantry project, Jen! 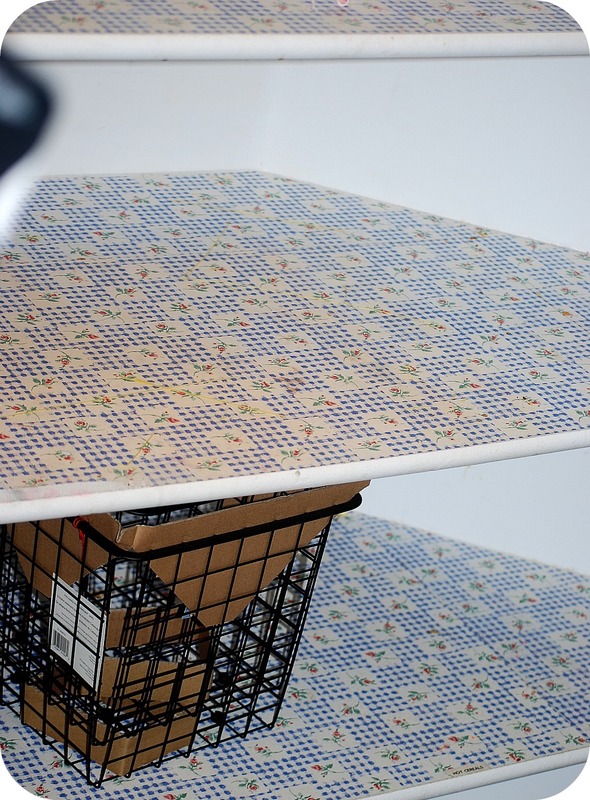 : ) What a great paint color that is and I love the idea of using those placemats on your shelves. I was wondering what they were and I like to put something down between my item and the shelf, too. Very neat! Wow! This post motivates me to redo mine! Thanks! Lok so sute! Wowzers! Would you like to come to my house? I'm pretty sure I have sudafed in my medicine cabinet. I'd be happy to give you some if you make my pantry look like that. I love your pantry makeover. You ladies are so inspiring I'm going to have to tackle my pantry soon. Can I borrow some sudafed? It really does look amazing. I would love for you to link to We're Organized Wednesday next week if you gat a chance. so funny! I was doing the same thing on Friday night! I should have taken a before pic too. Yours turned out adorable. I love the little details. It looks like a party in there! Sudafed or no Sudafed…it looks fab! Sorry you weren't feeling well, but the outcome is ADORABLE! 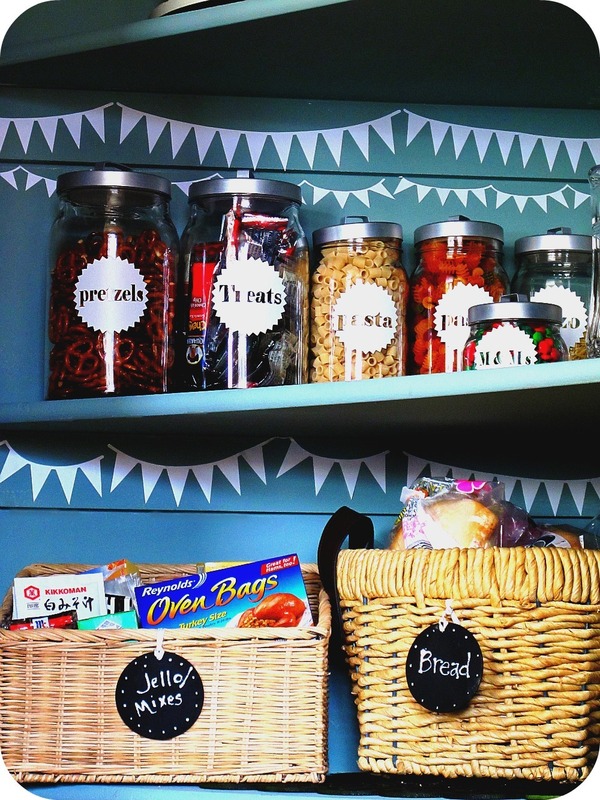 I have a pantry project I have been waiting to try, I want to line our shleves with oil cloth! Sweetie you can NEVER have enough Chandeliers…even in the pantry! LOL! Love everything. Very pretty and fun too! WOW! Jen, you truly amaze me! When I get terrible infections, the last thing I do is produce something beautiful like this!! 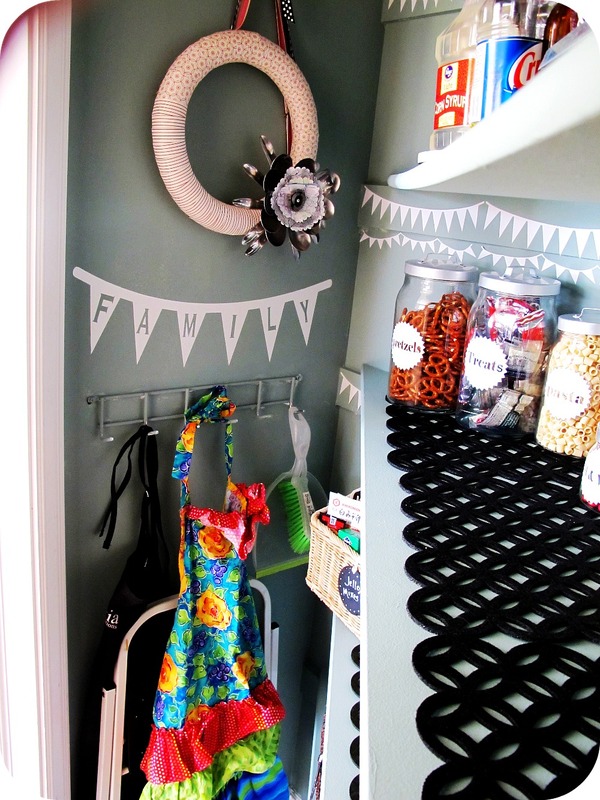 Wonderful pantry makeover, and the pennants are definitely you!